A while ago I shared a Never Have I Ever post and it was quiet a fun way to share some insights into the culture here. I hope through the year I can do more in depth posts about life here but until I get those written I have this for you. 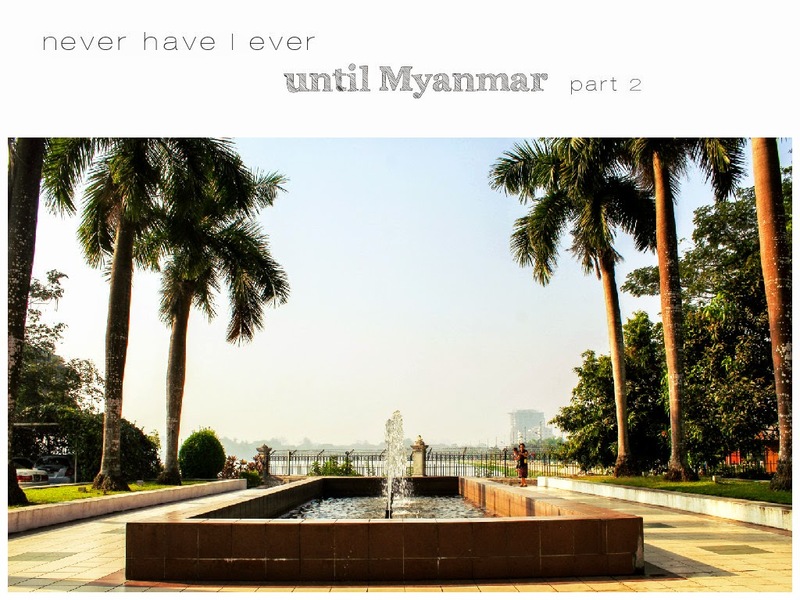 Never have I ever … been pooped on by a bird until I moved to Myanmar. Never have I ever … just accepted the fact that ants and I will share a kitchen. I know I will never get rid of all of the ants here! I have purchased some amazing tupperware and have learned how to hide all my food from them. Before I learned this though the ants ate my rare and precious cookie dough. Not ok, ants! Not ok! Never have I ever … had ants in my pants. One day I came into my kitchen and realized that there were these huge ants all over the dirty dishes. I finally got everything cleaned but felt like ants were crawling on me. Don't you have the feeling of a bug being on you but you can't pin point where? My back felt especially itchy and I asked Dave to check. He did indeed tell me there was a big ant and I did I wait for him to get it off? Nope! I started wiggling and panicking and that darn ant went right into my pants. Let just say that is the fastest I have ever removed my clothing. Probably .0005 of a second. Never have I ever … had a junior high girl tell me she eats at least ten servings of rice a day. I’ll admit, I’m not at all surprised! They love their rice here. Never have I ever … seen a more random religious convention. The Buddhist don’t rent out a building for their conventions but instead they come into the market we walk through, literally lay down hundreds of mats, and then put up a screen so they can hear a Buddhist monk talking. Before the mats were full of people they expect me to take off my shoes. I normally try to be respectful but I'm sorry, I have seen rats and roaches in the market and there was no way I was going barefoot. Later that evening I tried to go to an internet cafe and literally could not because of the throng of people. It was weird you guys. Never have I ever … seen marriage done so differently. It isn't the norm for everyone here but many people here have arranged marriages, get engaged before meeting someone, have a male ordered bride and marry someone they don't know well. This is all really different to me but it’s pretty normal here. Never have I ever … had so many people grab my skin because it is white. I was a little used to this from Korea but here I have had 3 people grab my arm just to touch my skin. One person was on their bike and did a drive by grab, one person was just on the street and just couldn’t resist and the last lady, well, let me tell you about her! The last lady must have been from a village because she just couldn’t get enough squeezes of my white arm. I’m guessing she has not seen many western people. Dave and I were sitting down, trying to map out our next destination and she came at me again but this time she gave me a big slobbery kiss. She even called her friend over to give me a kiss too but I put a stop to that real quick when I saw the other lady had red stained teeth from the beetle nut / tobacco they chew here. Sooo gross you guys! As you can tell Myanmar is full of adventures. But really life is full of adventures no matter where we live! What is something new to you from where you live? How would you handle someone grabbing your skin all the time because it was a different color? When I was living in Sydney we had a lot of people from Asia in our housing. Whenever they would first met us they were always grabbing my hair and wanting to take pictures with me. Definitely something I wasn't used to! i would have reacted the same way with the ant in my pants! no way!!! OH my ha ha the ant! but YUCK! I think I would have a freek out session every time I went in the kitchen! How do you deal with that? It never ceases to amaze me how vastly different cultures are! Never have I ever used my own two legs as my way of transportation to work then to Mass and back home! It is definitely a slower pace and I liked it, it was so nice to enjoy the beautiful day. That is definitely odd. I would be freaked out by that especially if I hadn't been to Asia before. Now I am just ok with it but a few years back I dont' know what I would have done. ha ha! They are crazy! They recently invaded my bathroom. I wouldn't pee in there because the ants were HUGE and that doesn't go together. Thankfully my friends sent me some ant traps so that took care of them for now. But really ... they moved from the kitchen to the bathroom while we were in Thailand. Weird! Well, you just get used to them. I also purchased air tight containers and put lots of things in the fridge. We wash all our dishes right away and if we don't wash them we rinse them clean. However, they moved from my kitchen to my bathroom. It was weird. My friends from home sent me some rant traps and they are working marveously! I rejoice when I see them eating the poison!!! That's fun that you are walking to work! I read your post about that but haven't been able to comment yet. It is a much slower pace of life but I love it! I find that I pray a lot when I am walking, plus it saves on gas and is free exercise. I hope you enjoy it long term. YES I think ant traps would be come my best friend!